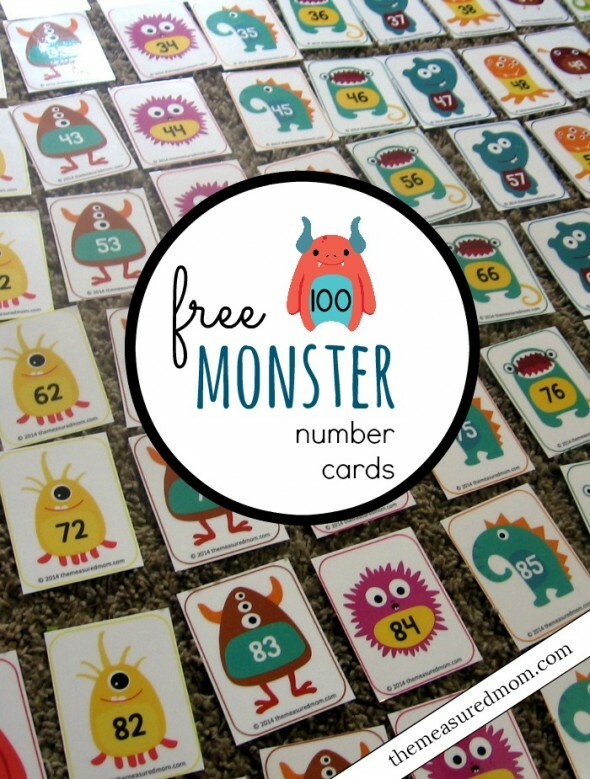 Today I’m sharing free monster-themed number cards from 1-100. Read on for ways to use them! 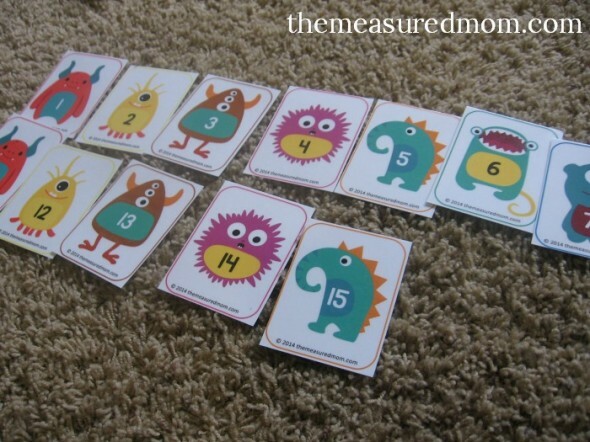 Last year I shared some monster-themed math for kids from preschool through grade one. 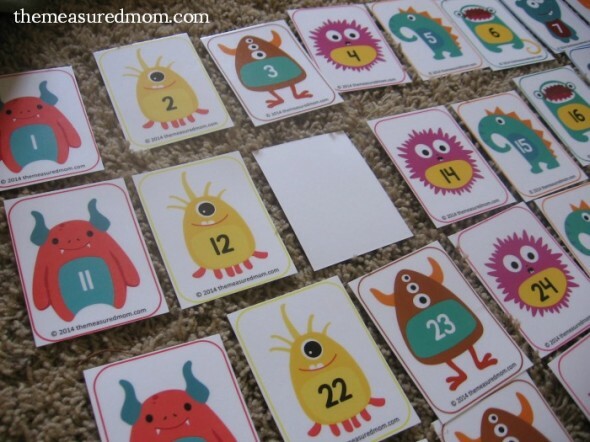 This year I decided to create another monster math printable… number cards from 1-100! Right away I was able to show him that each column has the same monster in it all the way down. As we worked I also helped him see that each number in a column ended with the same digit. Putting all the monsters into a giant grid was not something he could have done on his own. Obviously it took some time and patience to find the correct monster. Thankfully he had a mother right there who was nudging the cards in his direction. 😉 This way he only had to find the right card out of a pile of five instead of the whole giant set. If you’re just starting out with these cards, you might want to separate just a small set. Start with 1-10 and gradually add subsequent rows. 1. Say the numbers as you put them in order. Separate a set of numbers, like 1-20. As you put them in order, count together. 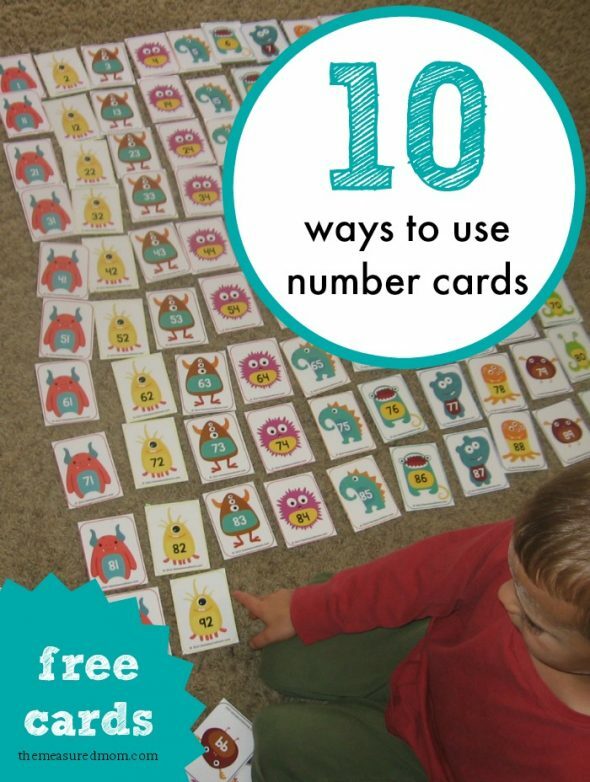 When you’ve finished setting them out, have your child point to each number and count again. 2. Learn to recognize larger numbers by creating a big grid. 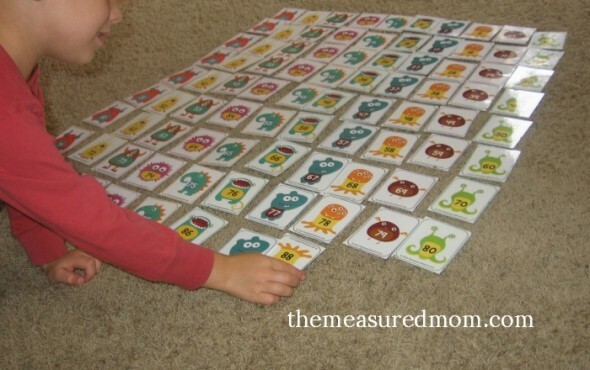 Those bigger numbers are tricky to learn, but if your child has many opportunities to see how they all fit together by creating this big grid, he’ll start to recognize them. 3. Do a number hunt. Help your child see that the numbers farther up on the grid are smaller than the numbers down below. In a row, the numbers earlier in the row are smaller than the numbers at the end. 5. Make connections to numbers. After we’d put together our grid, my son pointed to “4” and said “That’s how old I am!” He also found the ages of his siblings. Have your child find Mom and Dad’s ages too! 6. Find the missing number. Turn over a number. Have your child read the surrounding numbers and use other clues to figure out the missing number. 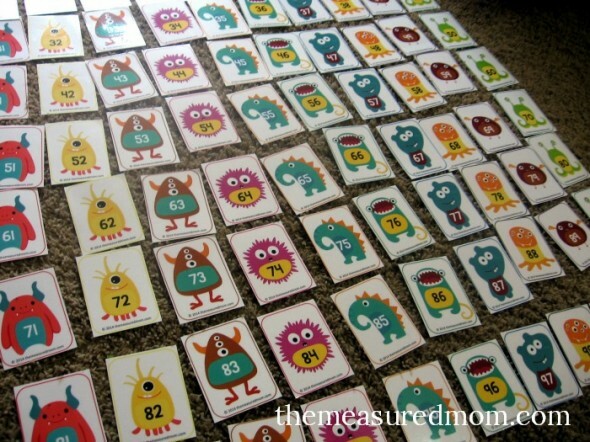 Your child can notice that each column has the same monster and ends with the same digit. He can notice that as numbers move along a row (20, 21, 22…) the second digit always gets one bigger. Older children can notice patterns related to skip counting, addition, and even multiplication. Get out a die and two playing pieces. Put your playing pieces on the first monster. Take turns rolling the die and moving ahead. How many rolls does it take to get to 100? Whoever gets there first is the winner. 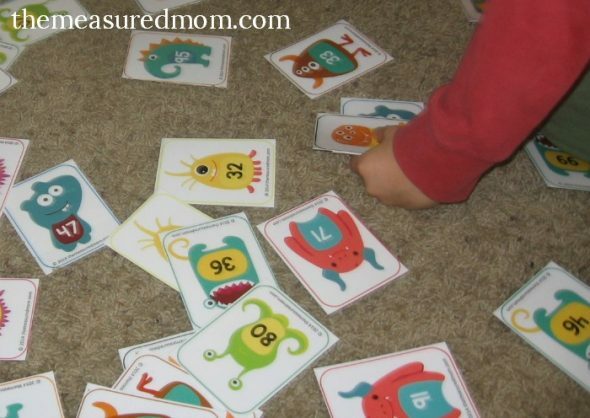 As you name the number you land on for each turn, your child will be getting a lot of practice recognizing those bigger numbers. 10. What’s the secret number? “I’m thinking of a number that’s larger than 10.” Child guesses 20. “Nope! It’s smaller than 50.” Child guesses 40. “It’s an odd number.” Child guesses 43. “The sum of the digits is 5.” Child guesses 23. You can see that you can make this as simple or complicated as you want. I hope you have fun with these! We stored them in a plastic bag and look forward to pulling them out again. P.S. I had a reader request GIANT monster numbers, one per page, for a Fall cake walk. Get the giant set of 1-50 HERE. Check out the rest of my free math printables! We just did something like it and it was so fun! You’re very welcome – enjoy! What a brilliant activity! My son is loving it. Thanks for sharing Anna. I’m glad you like them – and thanks so much for sharing, Sue! So glad you like them, Laurie! I think my 7 years-old son will love to play with these cards! Thanks so much! 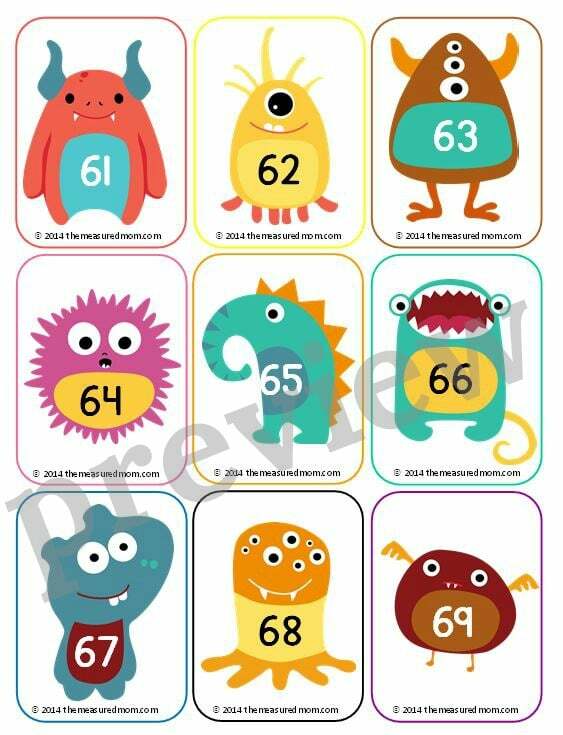 These number cards will go great in my classroom. My students have to learn numbers 120 before the end of the year. Do you happen to have this set all the way to 120? No, I’m sorry, I don’t. 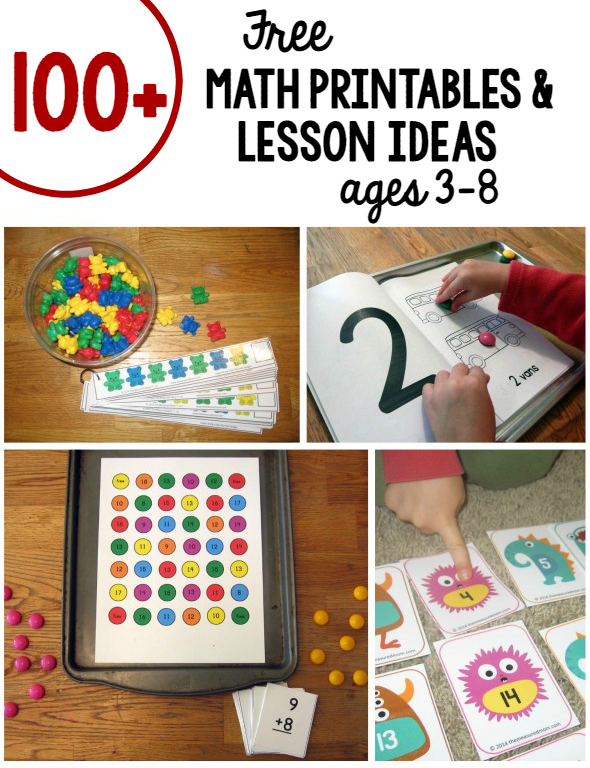 I \made 1-100 so they could be used as a hands-on hundreds chart. Oops! Thanks for the edit. Fixed it! Hi! 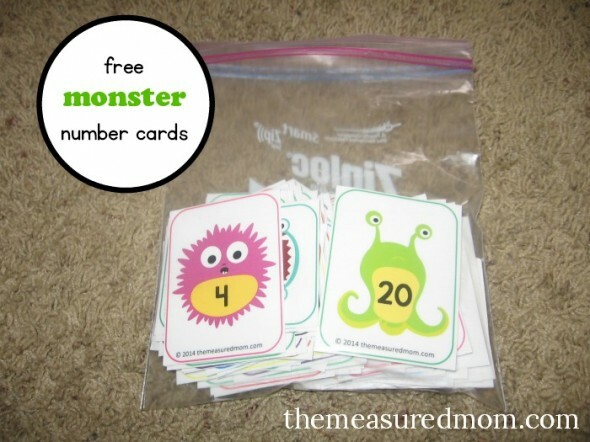 My counting monsters don’t show 10, 20, 30 and so on? Zip to the end of the download and you’ll see them! My students LOVE these numbers. We’ve been using them to keep track of how many days we have been in school, so I do wish the numbers went up to 180! Is there a reason why the numbers 103, 113, and 123 are black when all the rest of the odd numbers are white? Thank you for making these! Probably not 🙂 I was just rushing to make those at the request of a subscriber. Thank you for a fantastic set of cards. Is it possible to get a card with the number 0? The number 0 is a very important in math? You are a real life saver, I just want you to know that. I got your reply to my previous post and appreciate your quick response. I am now working with my 6 yr old on counting forward. We’ve now hit other obstacles as he keeps confusing 17 with 71, 12 with 21, etc, and generally reading numbers backwards. He also hasn’t grasped that 69 is greater than say, 15. But if I stay in the low numbers, he understands. It is one thing for a website to offer you activities that you can teach your kid and quite another when a website like yours teaches the PARENT how to teach their kids, and that is why I absolutely love what you’ve done. Sometimes, when my son doesn’t understand something, it’s my fault because I don’t know how to explain it to him. So I just come here for help =) Thanks again! That’s one of the best compliments I’ve received, Beth. Thank you so much! Thank you for sharing your wonderful tools and tricks! I’m just highlighting the fact that in the GIANT 1-50s there is actually not a 50 but another 1 in its place. Thank you for that edit – I fixed it. My kid has a project on her class and they need set of numbers from 1 up to 100 and I did check for it at the bookstore but its way too expensive for just a printed black and white numbers with no design at all so I just had to check on the internet to see if I can print numbers with design and yes thanks to you I can now simply print this great work of you and I know my kid would really love this and it will be fun for her while learning 🙂 kudos! I’m so glad these numbers are a good fit for you, Honey! These cards are wonderful thank you. I had them printed on color and yardstick for longevity 🙂 The number 100 seems to be missing from the set. It’s on the last page of the download. They are all there, but for ease of formatting they are not all in order. Zip to the end and I think you’ll find the ones you think are missing. I love these cards. I teach Pre-K, and several of my students are “playing” with these. They put them in order in a pocket chart, play Seek-a-Number, and have exciting conversations about the patterns they have noticed. Everyday, someone discovers a new idea. These cards will continue to be a mainstay in my classroom for the entire year. Thank you! This is so wonderful to hear, Teresa! Thanks so much for letting me know how you’re using them! Thanks for the suggestion, Rachel! However, my plate is pretty full these days and I don’t think I’ll have time for that addition. Hi! The number 10 is missing – can you please add it to the end? These are great! Hello, are the numbers 10 & 20 missing ? First of all, can I just thank you and commend you for all the hard work that you. Your site and ideas are amazing and so original, I can tell that you are a great teacher. So, this is my first year as a preschool teacher and I am having a tough time with some of my kids. The first term has passed and about nine out of eighteen still struggle with recognising their numbers 1-5. I feel like I have tried everything but they still just won’t learn. I have to add that these ones are the naughty ones. I was wondering if you had any advice and tips, or if you could guide me into anything on your site that could help my kids recognise these numbers so that we can move on to 1-1 correspondence. You may already be doing these things, but one thing I like to do is a lot of sorting and matching. So I would make a set of index cards with lots of 1’s, 2’s, and 3’s, and have them sort. Then eventually I would write each number on sticky notes and then place matching sticky notes around the room. The kids would name the numbers as they place the matching number on top. Another thing to try is my number tracing book. You can have them trace 1-5 every day with a finger (not marker) and name the number. They can do this multiple times in a day. 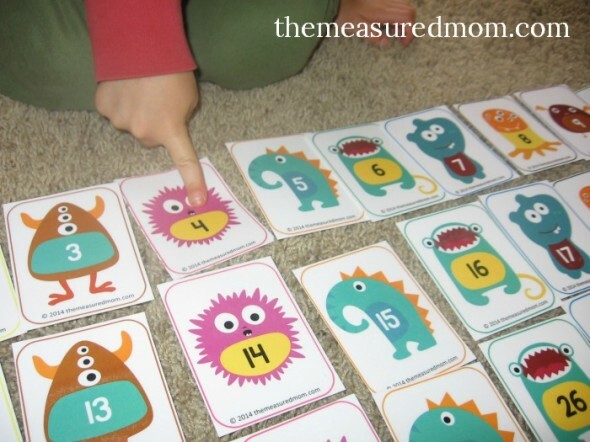 This type of activity has worked for many kids who struggle with letter recognition, so I would think it could also be helpful for kids who struggle with number recognition. I hope this helps a bit! 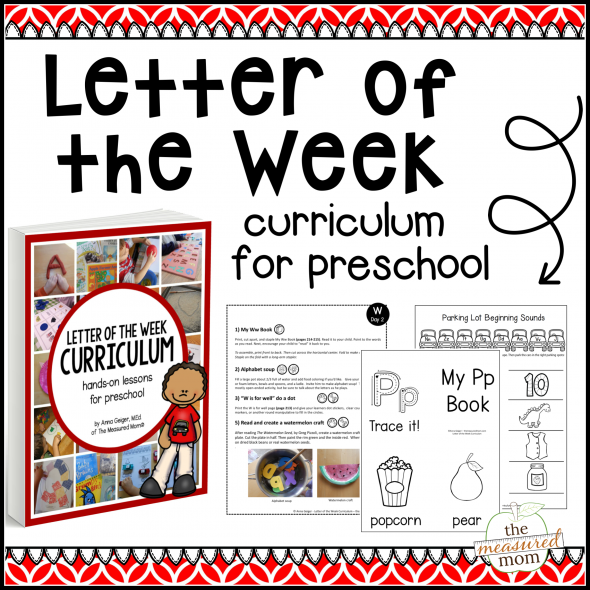 You can also contact Karen at Prekinders.com, who teaches just preschool and likely has more suggestions than I have.